Prednisone is part of the synthetic corticosteroids including prednisolone, methylprednisolone, dexamethasone and hydrocortisone. Prednisone is useful in treating multiple condition such as arthritis, polymyositis, rheumatoid arthritis, SLE ( collagen vascular disease), inflammatory bowel disease, multiple sclerosis, allergic reaction, asthma, leukemia, lymphoma and spinal cord compression as well as adrenocortical insufficiency. 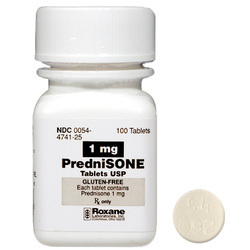 Prednisone may also be used as immunosuppression in cases of organ transplants, diagnosing case of Cushing syndrome and stimulation of maturity of the fetal lung. Prednisone may reacts as an analogous to endogenous glucocorticoids. Prednisone may inhibit phospholipase A2 which lead to inhibition of leukotriene formation and prostaglandin formation , vasoconstriction, stimulating protein catabolism and hepatic gluconeogenesis as well as stimulating the production of pepsin and gastric acid secretion. The common sides effect of prednisone is manifested as an excess of glucocorticoids. Patient may present with symptoms and signs which mimic Cushing’s syndrome. This may include, buffalo hump, fat at the back of the neck, moon facies/edematous facial appearance, central obesity, fat redistribution, hyperglycemia, impaired wound healing, osteoporosis, hypertension, increase susceptibility to infection, irritability and peptic ulcer disease as well as muscle wasting.